We like to think that all our customers are considerably above average, but every once in a while we encounter someone really exceptional. On January 25, 1999, our tech service department took a phone call from Elizabeth Tedford, a 7th-grader from Lansing, North Carolina. 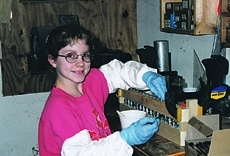 She was working on a science fair project that involved testing the adhesive strength of epoxy. I was immediately impressed with Elizabeth’s intelligence and grasp of the scientific method. She intended to investigate how temperature affects the strength of epoxy bonds, and she had a good plan. Elizabeth would limit the adhesive materials to just two: WEST SYSTEM® 105/205 and 105/207. And she would limit the substrate materials to just one: steel, specifically, steel bolts bonded head-to-head. She already knew that the testing forces needed to be controlled so they could be measured using the available equipment, a bathroom scale. She was wondering if she had chosen a worthy subject for research. I assured her that temperature is a very big issue for epoxies, especially room-temperature-cure epoxies. I recommended that she extend the high end of the temperature study to above 100°F, if possible. She listened carefully and then went to work. With some help from her father, Elizabeth was able to make some measurements with her apparatus. The way she used leverage is very much like some tests I have designed for Gougeon Brothers, Inc. While the number of specimens she tested was not statistically significant, she did find instances of surprisingly good adhesive strength for epoxy in cold temperatures (as low as 0°F). The judges recognized her work as outstanding, and awarded her first place in the county competition and second in the regional competition. We offer her our congratulations. She has won my admiration and a bit more.